In a bowl, cream butter and sugar. Add beaten eggs. 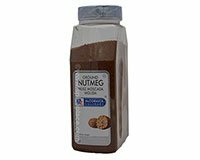 Mix sifted flour, salt, soda, nutmeg, and add alternately with molasses. Grease 13" x 9" cookie sheet. Spoon batter on and make 3 strips. Bake at 375° F for 10 to 12 minutes. Do not overbake. Cut into wedge shape while still warm.